During the bank crisis, the U.S. government took over Fannie Mae and Freddie Mac, two failing companies that insure and buy mortgages from banks. Since then Fannie and Freddie have been relentlessly evicting families who have trouble paying inflated mortgages. The Feds don’t even grant a hearing to homeowners who want to stop unjust foreclosures and save their homes! 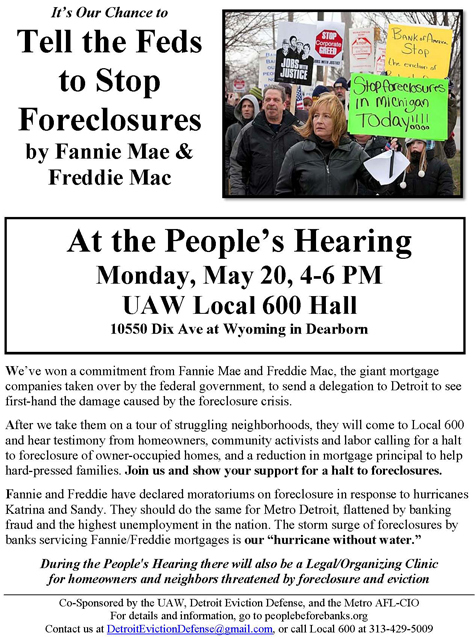 When Fannie Mae/ Freddid Mac officials come to town May 20, help us give them the message loud and clear that this devastation of our communities must stop, and homeowners deserve justice and real relief. It’s also not to late to sign — and circulate — the petition we will present them. Download flyer announcement in English and in Spanish.